Selling Large & Small Quantity Promo Ad Marketing Products since 1995. 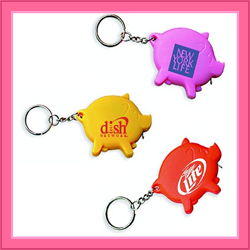 Pig Shaped Items are a hit these days – Perfect for Bacon Festivals, BBQ Businesses, Kids Events, and more, these Pig Themed Keychains come with a built in tape measure. Available in several colors, Imprint area approx: 1″ x 3/4″.